India with its capital New Delhi is located in Asia (Southern Asia, bordering the Arabian Sea and the Bay of Bengal). It covers some 3,287,261 square kilometers (slightly more than one-third the size of the US) with a population of 1,281,940,000. English, Hindi, Bengali, Telugu, Marathi, Tamil, Urdu, Gujarati, Kannada, Malayalam, Oriya, Panjabi, Assamese, Bihari, Kashmiri, Nepali, Sindhi, Sanskrit and French are the languages spoken by people in India (consider regional differences). Bangladesh, Bhutan, China, Myanmar, Nepal and Pakistan are bordering countries. 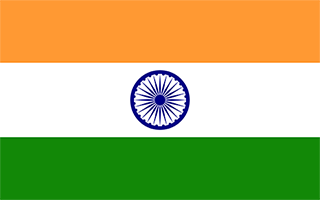 India is the largest country in the Indian subcontinent. Befitting its size and population, India's culture and heritage are a rich amalgam of the past and the present. India has a very rich and diverse mix of culture and tradition, dominated by religious and spiritual themes. India has 22 official languages and drinking alcohol can either be frowned upon or openly accepted, depending on the region and religion of the area within which you are drinking. There is no single unified Indian culture, and it's probably the only country where people of so many different origins, religious beliefs, languages and ethnic backgrounds coexist. India is big and has many outstanding landmarks and areas of outstanding beauty. If you really want to see all the worth visiting places in India, one tourist visa of six months can be argued to be considered enough. Allow considerable buffer time for any journey with a fixed deadline (eg. your flight back). Cannabis in its many forms is widely available throughout India, but they are all illegal in the vast majority of the country, and may mean years in jail! As a rule India is quite safe for foreigners, apart from instances of petty crime and theft common to any developing country. The topography is upland plain (Deccan Plateau) in south, flat to rolling plain along the Ganges, deserts in west, Himalayas in north. The average density of population is about 390 per km². The climate in India can be described as varying from tropical monsoon in south to temperate in north. Potential natural disasters are Barren Island (354 m) in the Andaman Sea has been active in recent years, droughts, earthquakes, flash floods, as well as widespread and destructive flooding from monsoonal rains and severe thunderstorms. To reach someone India dial +91 prior to a number. The local cellular networks are operated on 900 MHz, 1800 MHz, 3G, 4G. Websites typically end with the top level domain ".in". If you want to bring electric appliances (e.g. battery chaarger), keep in min the local 230 V - 50 Hz (plugs: C, D, M). The sign for the locally used currency Rupee is INR. Three equal horizontal bands of saffron (subdued orange) (top), white, and green, with a blue chakra (24-spoked wheel) centered in the white band; saffron represents courage, sacrifice, and the spirit of renunciation; white signifies purity and truth; green stands for faith and fertility; the blue chakra symbolizes the wheel of life in movement and death in stagnation.